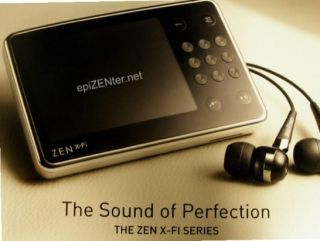 Details about Creative's forthcoming ZEN X-Fi player – it's new portable media player (PMP) with Wi-Fi compatibility – have leaked online over the weekend. Fansite epiZENter reports that Creative's new digital audio player is set to feature an SD expansion, built-in WiFi, speakers, an FM tuner and a voice recorder. The Wi-Fi feature will allow users to stream media from Creative's 'Public Media Server' as well as being able to chat on instant messaging services such as Yahoo! Messenger and Microsoft Live! The X-Fi's specs also include two new sound effects "Crystallizer" and "Expand" and support for MP3, WMA, AAC, WAV and Audible, plus WMA video, MPEG4, DivX and MJPEG video. The devices' improved battery life is also said to offer 36 hours of audio playback or 5 hours of video playback. Stay tuned for more 'official' details from Creative on further specs and X-Fi pricing as and when we get them.